Welcome to winter…in my opinion, the best season in which to set a ghost story (that is, if your story setting is somewhere that gets cold, snowy, gray, and damp). While winter’s characteristics seem to make it an obvious choice, it still takes a great writer to exploit them properly to evoke the shivers. No story does this better than Amelia Ann Blandford’s Victorian chiller “The Phantom Coach,” set in December on “a bleak wide moor in the far north of England.” Consider: “…the first feathery flakes of a coming snowstorm just fluttering down upon the heather and the leaden evening closing in all around. I…stared anxiously into the gathering darkness, where the purple moorland melted into a range of low hills, some ten or twelve miles distant.” It’s the “feathery flakes…fluttering” that creates the sound of snow in the reader’s ear, and even when our weary lost man is given shelter in the warmth of a cottage (complete with odd owner, creepy manservant, and scary tall tale), it’s hard to escape the press of the barren lands just outside the walls. By the time we reach that terrifying climactic scene (there’s one paragraph that’s so frightening the image it created is burned into my mind—I’d love to print it here, but I’d spoil it for all of you), we’re as damp, cold, and isolated as the narrator—and that chill is unshakable well after we’ve digested the story’s shocking last line. Don’t miss reading this by the fireplace. For sure. Amelia Ann Blandford, “The Phantom Coach,” in Classic Victorian & Edwardian Ghost Stories, comp. by Rex Collings (Hertfordshire: Wordsworth Classics: Wordsworth Editions Limited, 1996), 150. 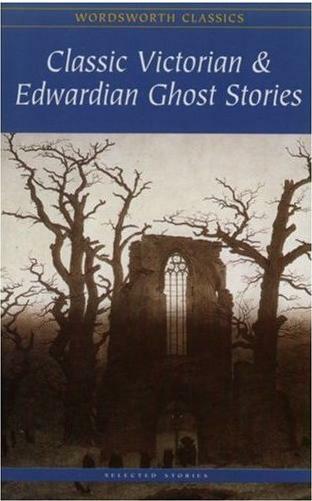 Posted on January 5, 2012, in GhoStory Guru and tagged Amelia B. Edwards, ghost stories in winter, moors in England, Scary Stories, Victorian Ghost Stories. Bookmark the permalink. Leave a comment.